In May 2014, the Sixty-seventh World Health Assembly adopted resolution WHA67.24 on Follow-up of the Recife Political Declaration on Human Resources for Health: renewed commitments towards universal health coverage. In paragraph 4 of that resolution, Member States requested the Director-General of the World Health Organization (WHO) to develop and submit a new global strategy for human resources for health (HRH) for consideration by the Sixty-ninth World Health Assembly. 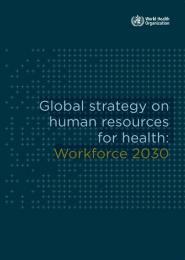 The development of the Global Strategy was informed by a process launched in late 2013 by Member States and constituencies represented on the Board of the Global Health Workforce Alliance, a hosted partnership within WHO (whose mandate came to fruition in May 2016). Over 200 experts from all WHO regions contributed to consolidating the evidence around a comprehensive health labour market framework for universal health coverage (UHC). A synthesis paper was published in February 2015 and informed the initial version of the draft Global Strategy. An extensive consultation process on the draft version was launched in March 2015. This resulted in inputs from Member States and relevant constituencies such as civil society and health care professional associations. The process also benefited from discussions in the WHO regional committees, technical consultations, online forums and a briefing session to Member States’ permanent missions to the United Nations (UN) in Geneva. Feedback and guidance from the consultation process are reflected in the document, which is also aligned with, and informed by the framework on integrated peoplecentred health services.